That’s not what people say when they break up. Or when they quit their job. Well, not often. Mostly, people aren’t confrontational. They just want to get away with little fuss. So when people quit they’re prone to forego candor. Instead, they may blame quitting on all kinds of things. Some just walk away without warning. Others sneak away quietly due to some family emergency or other contrived excuse. Anything to avoid a show down. It’s all just as well. Bluntness wouldn’t likely do any good. And it might hamper the future prospects of the quitter. It’s a no win situation – being candid about why you’re really quitting! Besides, the person you’d have to be candid with about it is the culprit himself – the boss. He’s the reason you’re leaving. Best to leave in the most gracious way possible by saying as little as possible. 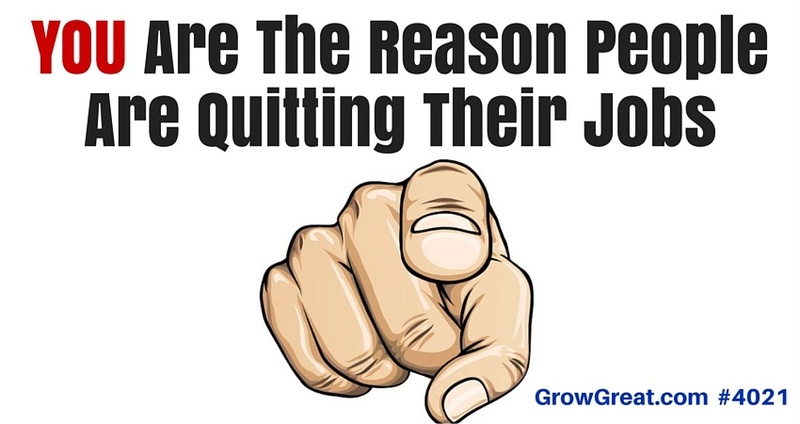 Almost 8 years ago Jennifer Robison, Senior Editor of The Gallup Business Journal wrote an article entitled, Turning Around Employee Turnover. The article lists the top 5 predictors of employee turnover. 1. The immediate manager. If employees report that their manager’s expectations are unclear; or that their manager provides inadequate equipment, materials, or resources; or that opportunities for progress and development are few and far between, watch out: Trouble is on the way. 2. Poor fit to the job. Another sign of trouble appears when employees perceive that they don’t have opportunities to do what they do best every day. 4. Pay and benefits. Engaged employees are far more likely to perceive that they are paid appropriately for the work they do (43%), compared to employees who are disengaged (15%) or actively disengaged (13%). And pay and benefits become a big issue if employees feel that their coworkers aren’t committed to quality; they may feel entitled to extra compensation to make up the difference or to make them feel like they are truly valued by their employer. 5. Connection to the organization or to senior management. Another key sign that turnover may be looming appears when employees don’t feel a connection to the organization’s mission or purpose or its leadership. Who cares? So what if people come and go in your company? The U.S. Bureau of Labor Statistics has found that the U.S. voluntary turnover rate is 23.4% annually. It’s generally estimated that replacing an employee costs a business one-half to five times that employee’s annual salary. So, if 25% of a business’ workforce leaves and the average pay is $35,000, it could cost a 100-person firm between $438,000 and $4 million a year to replace employees. Still don’t think it matters if Joe walks out? Too many bosses don’t care. They think people are plug ‘n play interchangeable parts. Joe leaves. Jim enters. Jim leaves. Josh enters. Josh leaves. Jill enters. Of course, it all started with Abe. Over the course of three decades the organization is fast approaching the end of the alphabet. Then it all starts over again. Hundreds of thousands of dollars in lost dollars and productivity to even a small business. Millions of dollars to a larger enterprise. If you think VC money often goes down the drain – and it does – then you need to consider the high price of human capital. Millions of people are going down the drain every day in organizations all over the world. It’s not because they’re bad people, or unskilled, or unproductive. It’s because they’re working for a jerk and they just can’t stand it any more. How do you make a boss care? You don’t. Truth is, you can’t make a business owner, a CEO or any other boss care about something. You may be able to persuade them why they should care. You may be able to influence them with compelling data, or an engaging story that just might convince them it’s in their best interest to care. But they have to care about people enough to create a culture that fosters superior human performance. Higher human performance should be the priority of every CEO. Should be, but it’s not. Lower levels executives – even mid-level bosses – can often behave with greater disdain than the disinterested CEO. Disinterested in making sure people are properly trained, coached, encouraged, rewarded and held accountable. Not caring if people leave and not caring why they leave is the mark of a boss who should not be the boss. They’re destructive to their enterprise. No amount of process management proficiency can outweigh the greater rewards of higher human performance. It’s simple math. One boss can destroy the work of everybody who reports to her. She can’t possibly perform alone at a high enough level to outweigh her damage…even if she’s only got a handful direct reports. The more people she has reporting to her, the greater her damage. The problem seems complex because of how varied we are as humans. One boss tasked with leading some number of other people is outnumbered. Just like the coach of a professional sports team has one personality, style and philosophy is asked to coach up to dozens of players who are all very different. They’re different from the coach, and from each other. So the challenge is figuring out how to best lead the entire group – the whole team – and to also lead each individual player. Quite frequently professional sports has it more right than business. They fire the coach and keep the talent. We tend to let the talent walk away refusing to consider that the boss is the reason. Pro sports views it from a more economical and practical model. It’s easier to replace the boss than it is to replace major chunks of the team (talent). Businesses don’t tend to see it that way. We often choose to diminish the value of the player because we think that enhances our own worth. We’re wrong. Expensively wrong. Stupidly wrong. Once upon a time I’d try to evangelize every leader who seemed disinterested in his employees. Over time I made adjustments to that strategy. Mostly because I found it futile. Not always, but mostly. Emerging leaders – those folks flying at lower altitudes, sometimes early in their management careers – often seemed more open-minded to the logic (and heart) of treating people well. Well doesn’t mean easy. Nor does it mean without confrontation or accountability. It means doing the right thing to help people succeed. It means behaving toward employees so they can become the best versions of themselves. I’d dive into a series of questions aimed at discovering the cost (the overall toll) of employee turnover. Oddly enough, I found lower level leaders could more easily see the business reason to put people first than the chief leader, who most often was steeped in a long-held philosophy of not caring so much. If the person at the top had such a strong personality of not caring, then it was sure to be difficult to convince lower level leaders to hold a contrary philosophy. After all, the chief’s direct reports want to please him. Being like him in philosophy and behavior can be a safe career move. As much as I believe in a skunkwork (a term made famous by Lockheed Martin), there are severe limitations to grass roots works. Most of us use the term to mean some under the radar, secret endeavor or initiative. Sometimes it may be a bottom up sort of thing. As valuable as those may be, they’re ineffective compared to an initiative fostered by the top dog. When the CEO speaks, everybody listens. Lower level folks can scream and shout and still the boss may not hear it. Or care. Sadly, nothing trumps voting with your feet. 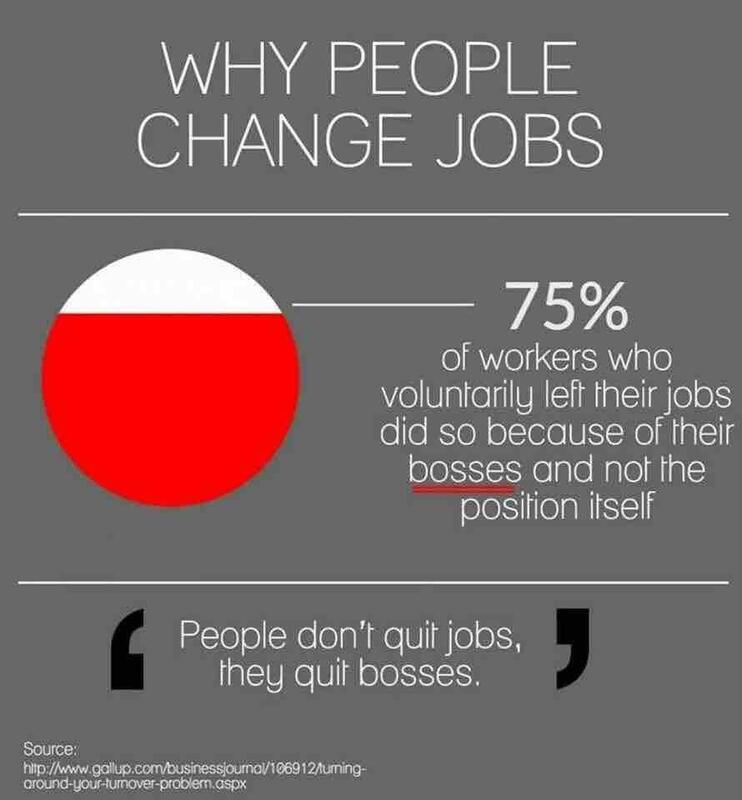 That’s why employees working for a jerk quit. Not all of them, of course. Some are trapped. I’m thinking of all the stories I’ve heard throughout my life of single parents who simply need a job — and lost their self-confidence long ago. They’ve been fooled into thinking they have no other options except to endure the bad boss. They stay. Dwarfing their development with every passing day. De-energized by the environment and their boss. But hey, it’s a paycheck. And that’s what they need most. That’s exactly why they’re losing people. They just don’t care about others. Self-centeredness prevents them from seeing the value of high human performance. It’s all about them. The quitters have forsaken them, betrayed them and created more work for THEM. They see leadership as a position that deserves to be served – not a position that deserves to serve! A stark difference between being the recipient of service or the purveyor of service. Leadership is a position of service. The higher the position, the more powerful the service rendered. Today, I focus on working with CEOs and top leaders who understand this – and who see the world as I do. It’s more profitable to pass on the philosophy that organizations are best built by using the highest human performance possible. And by finding ways to continue to elevate it. It’s building an A team, then maintaining a culture committed to superior performance. It’s not easy work, but it’s the most profitable way to go. Nothing will elevate an organization’s performance faster, or more, than leveraging the people who do the work. You don’t have to believe me. In episode 4019 I referenced two leaders who operate multi-BILLION dollar businesses. They see people as their greatest asset. That’s what I’m urging you to do, even if it’s contrary to how you’ve been operating. As always I just hope to provoke you to think about what you do. And why. Re-examine things. As the boss, you’re constantly asking people to improve. All I’m asking is that you devote yourself to the same thing – your own improvement. Stop letting talent run out the door. It’s preventable. It’s up to YOU to stop it because too often, YOU are the reason for their leaving.